Urban and regional planning programs aspire to prepare practitioners to write and implement plans, primarily at the local level of government. These programs are very much "professional" in their aspirations, as opposed to research oriented. Yet, academic planning programs often place greater emphasis on theory than practice. For decades, the planning academy has acknowledged a major disconnect between what the planning academy teaches students and the techniques and skills needed to be a successful professional practitioner. Fundamentals of Plan Making will give planning students an understanding of research design as it applies to planning, develop familiarity with various data sources, and help them acquire knowledge and the ability to conduct basic planning analyses such as population projections, housing needs assessments, development impact analyses, and land use plans. Students will also learn how to implement the various citizen participation methods used by planners and develop an appreciation of the values and roles of practicing planners. 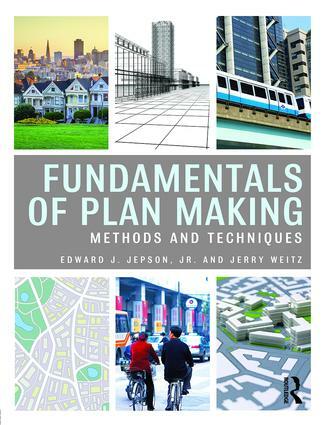 In Fundamentals of Plan Making, Edward Jepson and Jerry Weitz bring their extensive experience as practicing academics and give planning students the practical, hands on tools they need to implement the various methods used to create and implement real plans and policies. Its chapters on transportation, housing, environment, economic development and other core development topics also make it a handy reference for planning practitioners.